They do things differently on the Norfolk Broads. The 120 miles of navigable waterways are a sailor’s paradise, but for the uninitiated, the narrow rivers, frequent obstructions and windshifts of the can appear daunting – here at PBO we’re more used to having a bit more water under the keel and sea room under our lee. 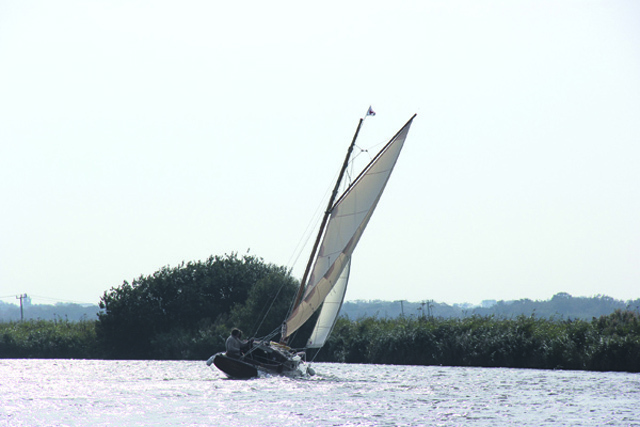 But keen to learn more we went sailing on the Norfolk Broads for a day, where local sailing instructor Mark Elson took us for a spin on the Thurne and up to Potter Heigham, before heading back down the Bure and Ant – ensuring we experienced a wide range of rivers from wide to narrow. We were in a Pegasus 700, The Alternative, a typical Broads cruiser co-owned by Sue Head and friends. They use her for pottering and family cruising from her base at Thurne Mouth. 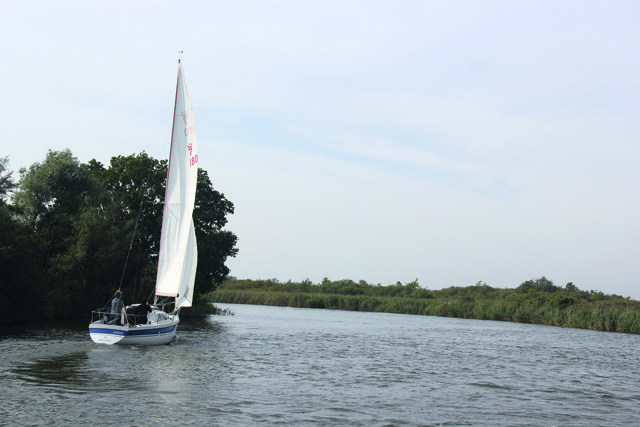 Sue came along for the day to show us the ropes: like Mark, she grew up sailing on the Broads. 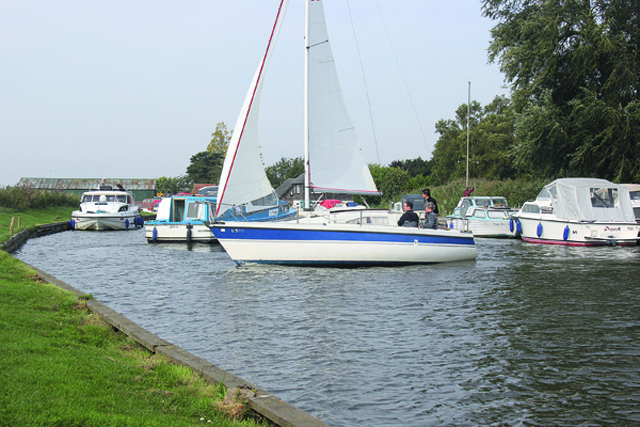 They have both raced and cruised in a wide range of boats, from classic Broads racers and punts to cruisers and dinghies. 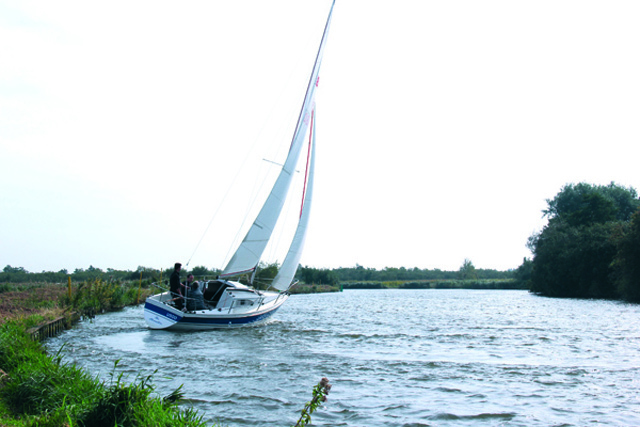 Mark works as a sailing instructor and has developed encyclopaedic knowledge of the Broads and how best to tackle them under sail. Who better to impart some tricks and tips and local knowledge of sailing in rivers? 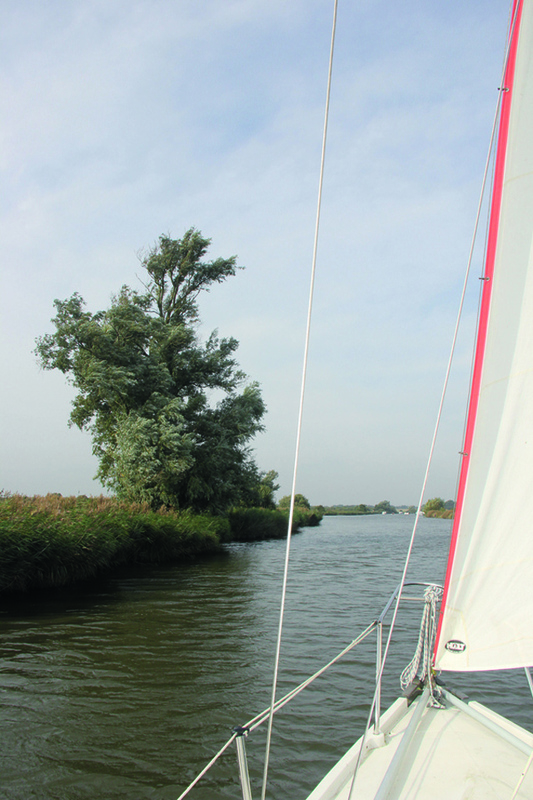 We cast off from the inlet at Thurne Mouth, motoring out into the Thurne before hoisting the sails. 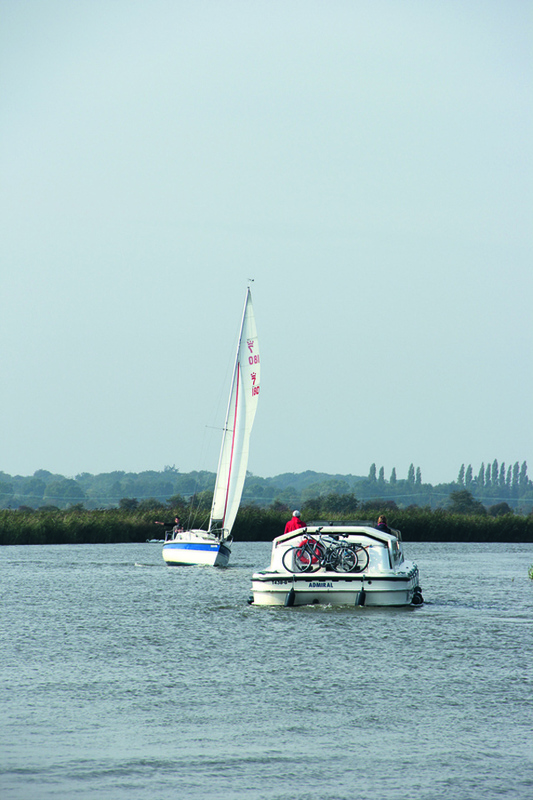 The Pegasus’ tall fractional rig proved ideal for the fickle and shifty winds to be found on the Broads – and her tabernacle-mounted mast makes her well-suited to tackling the Broads’ many bridges. 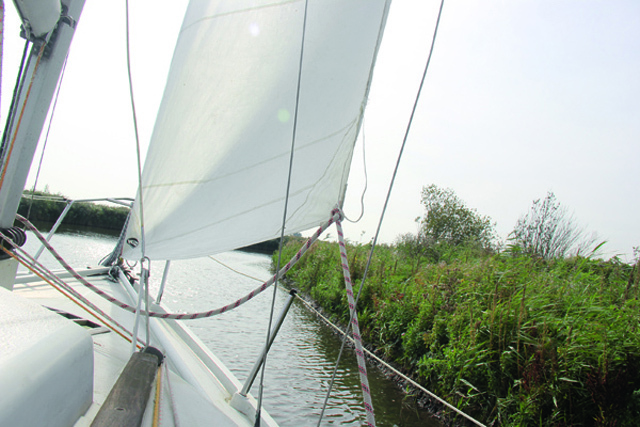 With full sail hoisted, we began to beat up towards Potter Heigham, allowing Mark to demonstrate some of his tips for beating up a narrow river. Many small cruisers have a tendency to slip sideways until their speed builds, so it’s worth footing off a little to build up the speed. Once you have the boat speed, you’ll get the pointing as the foils begin to work. This means keeping the sails eased a little out of a tack to build the speed, grinding in the final few inches once you’ve got the foils working. Similarly, if you want to squeeze past an obstruction, it helps to keep the boat speed up until the last minute. If you pinch from the start, you’ll slip sideways and find that you won’t have enough lift to clear the obstruction. As a Norfolk novice, I tended to put the helm down as soon as I closed with the leeward riverbank. But when Mark was on the helm, it was noticeable that he would hang on much longer and tack much later. How? He explained it was the lee bank effect. As the boat was just brushing the reeds, he headed up a few degrees. 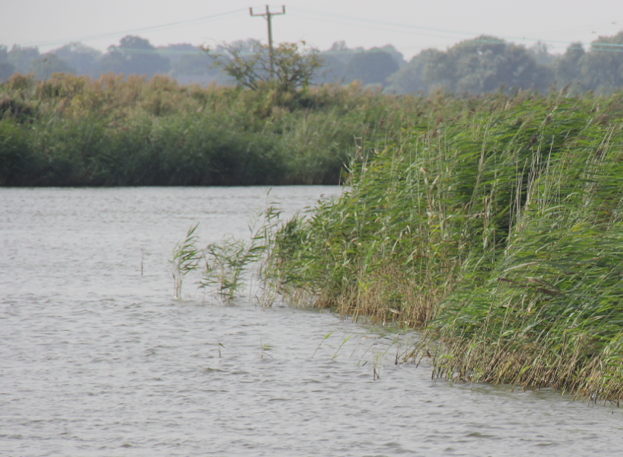 The interface between reeds and river created a lift, just enough height to keep the boat clear of the bank. The boat’s fin keel and the riverbank compressed t he water, giving the boat some lift away from the bank. At times the quarterwave was breaking on the reed bed, but the lift generated was often enough to take us 100m or so further on from the point at which I would have said we’d needed to tack. As well as the water effect, the sails fill as you luff up because the wind slows as it crosses the reeds: your aim therefore is to heel the rig into this more favourable wind angle, ie over the reeds. When the wind crosses a shore it tends to do so at right angles. On a smaller scale this means you may sometimes get a lift as you hug the weather shore of a river. This only works if the wind is blowing across the river at an angle – therefore you have a long and short tack. As the wind blows over the weather reeds and into the river ‘valley,’ it’s angle will shift unfavourably as it follows the river: ie it will head you. So, as you tack on the windward side, you should aim to keep the rig in the more favourable wind angle that comes off the land for as long as possible, before the rig picks up the more heading wind blowing down the river. Water will find its way to the outside of a bend – which means that if you’re beating against the tide, there may often be a fair eddy approaching the inside of the bend. Equally, if you’ve got the current with you, stick to the outside of the bends. 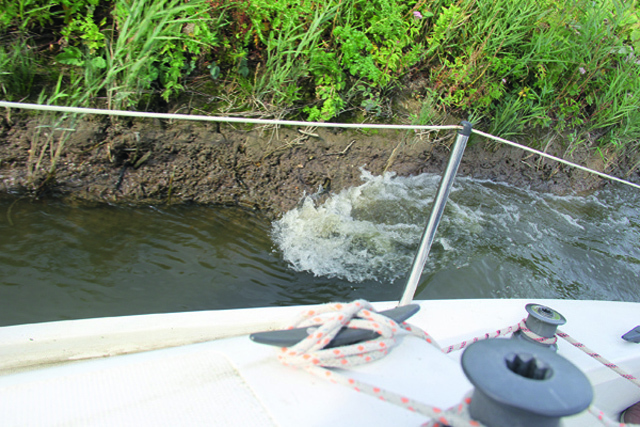 The tide scours the outside of a bend too, so you can expect to find more water there. Mark says it pays to study the object that is creating a wind shadow before deciding how best to pass it. Single buildings and trees will cause a narrow wind shadow that spreads out as it gets further away from the obstruction, so it pays to pass close to it – you’ll get through the shadow quicker. More sustained blockages – collections of trees or buildings – will cast a bigger shadow. With these, Mark recommends passing around two-thirds of the way across the river. This will keep you out of the main area of wind shadow, while avoiding disturbed breeze that is reflected from objects on the lee side of the river. Hold the boat head-to-wind for a few seconds to gain as much to weather as you can in each tack – but don’t push it too far. A high-aspect-ratio rig can be a boon on a river, as it keeps sail area high up and clear of the lee of trees. 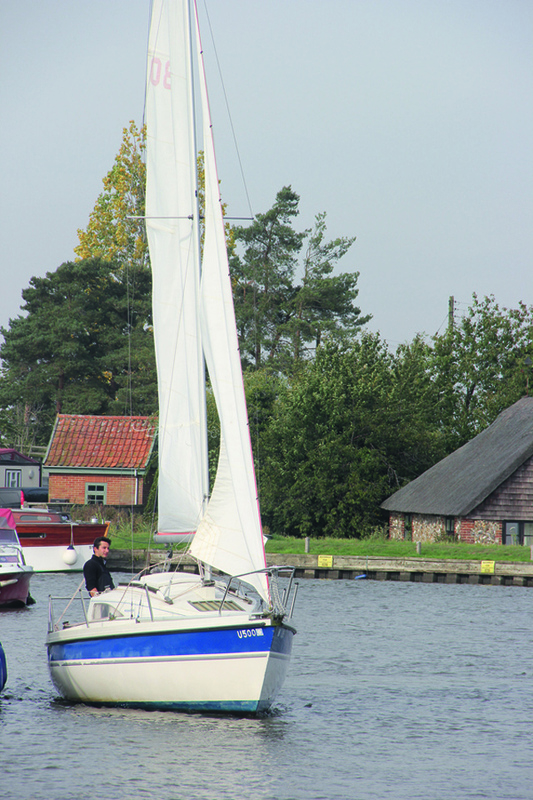 That’s why boats like this river cruiser, with its gaff rig and large topsail, are so effective on the Broads. Mark recommends sailing with some more twist than you would at sea, in order to keep the sails driving in fickle airs. In medium to strong airs it also helps as the change in apparent wind angle higher up is exaggerated due to the low down slowing effect of the surrounding ground/reeds. Keep looking up at the sail: the wind on the water is often different to that found at the masthead. A non-overlapping headsail can help you tack frequently and more easily. One frustrating thing when you’re beating up a river is that the wind will tend to follow the river, so that river bend ahead you think will let you ease the sheets will mostly just head you. You can use the topography to your advantage, however, by anticipating the shifts and sailing up the inside of each bend (and thus wind shift). Alternatively, keeping to the leeward bank will give you a bit of extra lift (see Tip 2) that should just squeeze you round the river bends. Keep thinking one step ahead. 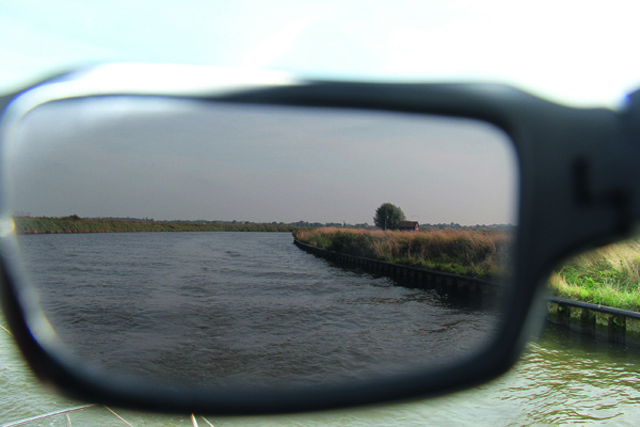 Especially on rivers like the Broads, you can see wind on the water – Polarised sunglasses help. Stick to areas where the wind is visible to avoid being becalmed. Looking ahead, you’ll be able to see bends in the river, and it can pay to stay cracked off on the windward bank to help ensure you will make it around the next corner. I’d never sailed on the Broads before, and even out of season found the steady stream of motorboats a little intimidating. Mark, a seasoned veteran of meeting motorboats head-on, kept calm. ‘Keep your speed up, and don’t pinch,’ he said. ‘With speed comes manoeuvrability: if you pinch to get past a boat and lose your speed, you might also lose the steerage way or end up in irons.’ He also advised that it’s best to make your intentions clear from the outset – and indicate with hand signals what you intend to do. Sailing in rivers doesn’t need to be taxing – and doesn’t have to mean simply starting up the engine. With some knowledge and a thorough understanding of how your boat responds, navigating rivers under sail is a great way to explore.